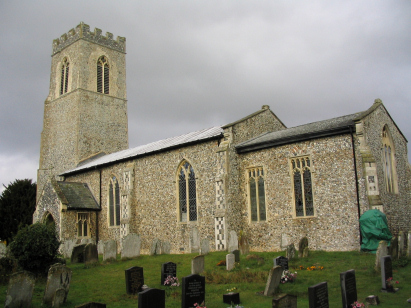 The parish of Mulbarton sits just south-west of the city of Norwich about 6 miles along the B1113 which links Norwich with New Buckenham. The village has grown dramatically over the recent times to serve as a commuter village but still retains the glorious common green around which the original settlement is sited. Most housing now lies to the east of the B1113 between the village cross-roads and the Norwich to London railway line. With growth in population the essentials of village life have been retained with shops, pubs and an active community still present. St Mary Magdalen church sits in a dominant position overlooking the village green and adjacent to the entrance to the hall. 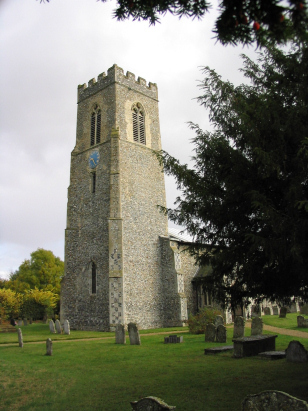 Unlike most in Norfolk this church is somewhat later with most in the Decorated style indicative of very late 14th and early 15th century although the chancel is clearly older. Like many churches much was disturbed in later Victorian makeovers and St Mary is no exception which extensive modifications dating from 1875 masking many original features. Two register books - both standard 800-entry ledgers - cover the period of the transcript. The books are recent filming and both are reproduced on Microfilm MF1685 in the collection of the Norfolk Record Office and from which this transcript was prepared. As with most recent films the quality is excellent with clear and contrasting images. However it must be stated that the registers have suffered from a poor standard of handwriting and the latter part of the period especially is a struggle to decipher at times especially for those families who are transient and may have a single entry in the register. As a consequence there is a health-warning that errors may have occurred in reading these entries although it is to be hoped the actual occurrence is minimal.